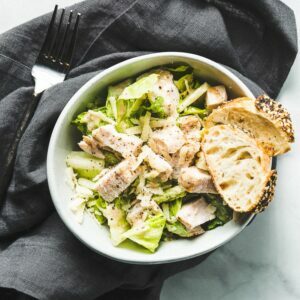 A quick and satisfying 5-minute weeknight meal or make ahead lunch caesar salad made with perfectly cooked sous vide chicken breasts. 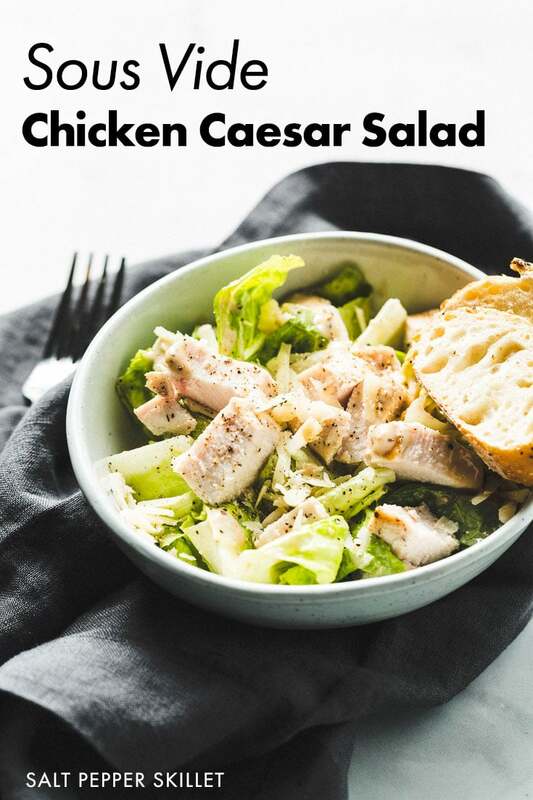 A chicken caesar salad is super satisfying and quick weeknight meal that we go to all the time for lunch or dinner. The chicken can be sous vide ahead of time so you just grill it and serve with the salad. There’s really not much else to it, but to dig in and enjoy. One of my most popular recipes is Sous Vide Chicken Breast. 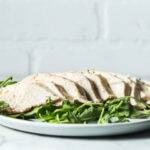 Not only is it this one of the healthiest protein-packed ingredients, but it’s the best way to make boneless skinless chicken breast actually taste great with almost zero effort or fat. The chicken breasts are seasoned with kosher salt and freshly ground pepper, vacuum sealed, then sous vide in a water bath at 145° F for 1 1/2 to 2 hours. Head on over to the complete guide for cooking sous vide chicken breasts for all the details and a video. I have to admit that we rarely make my own homemade caesar dressing. 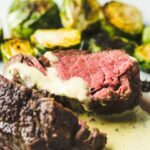 It’s not that it isn’t amazing or fairly easy to make; but for a weeknight meal, it’s just so much faster to grab a bottle of Brianna’s Asiago Caesar Dressing (Amazon affiliate link). This is the Caesar dressing that we have been buying for years, and it’s the best store-bought version that we’ve tasted. While we do buy and use store bought Caesar dressing, you will never find a bag of store bought croutons in our pantry. If you want to make some quick and super easy croutons for this salad; just dice up some bread, toss with some olive oil and bake at 400 degrees until golden brown. You can even make quick croutons on the grill if you plan on grilling your sous vide chicken. Grill the sous vide chicken breasts on each side for 30 seconds to 1 minute, then dice or slice it on a cutting board. 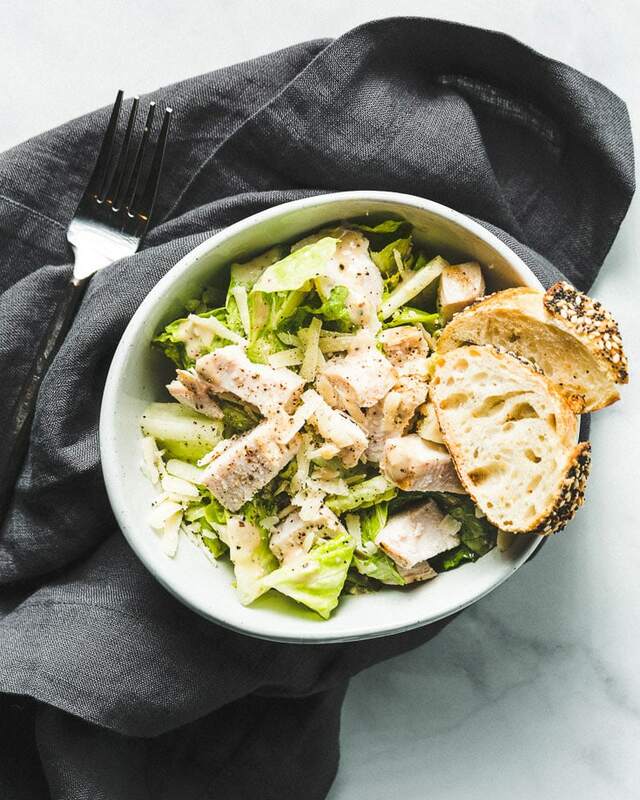 In a medium bowl, toss the desired amount of dressing with the lettuce, diced sous vide chicken breast, parmesan cheese and croutons if using them. The romaine lettuce can also be sliced in half lengthwise and grilled. 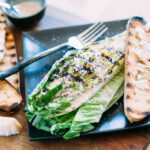 You can find the recipe for Grilled Caesar Salad here.